Theodore Lenneberg proposed a new and luxurious hotel at Deep Water Point. 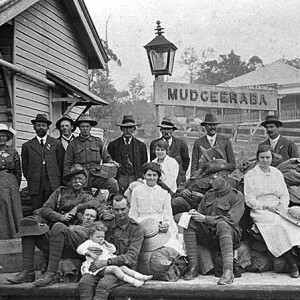 The first hotel to open in Labrador, known as the Labrador Family Hotel, was located north of Loders Creek beside an unnamed creek at a small point on the Broadwater foreshore. The area offered reliable mooring for boats and was named Deep Water Point. As a result the hotel was also known as the Deep Water Point Hotel and was often described as being in Southport. Built before 1881, the hotel was described as a house containing three sitting rooms with fifteen bedrooms and was the terminus for the Cobb and Co. Coaches. In June 1884, John Langlands applied for a Country Publican’s License for the sale of liquor and purchased the management of the hotel from Charles Tulk. 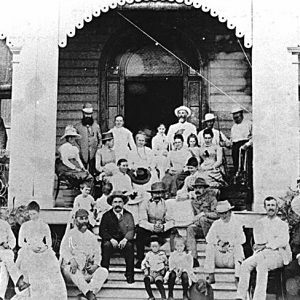 By the late 1880s, the original Labrador Hotel was owned by Mrs Cooke of Sydney and appears to be used as a residence or boarding house. 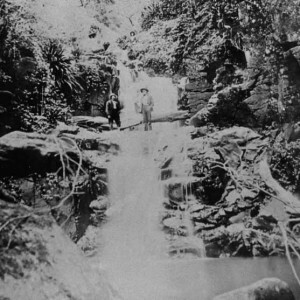 It was eventually destroyed by fire in July 1895. 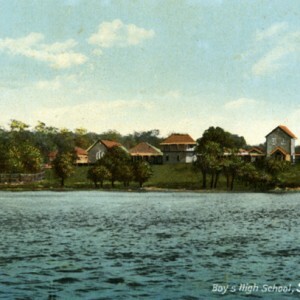 In the closing decades of the nineteenth century, Southport was increasingly seen, and promoted, as a premier seaside resort with state government officials and wealthy landowners from outside of the region building extravagant holiday homes along Marine Parade overlooking the Broadwater. Following the arrival of the railway in 1889, visitor numbers to Southport expanded, especially during the holiday season. 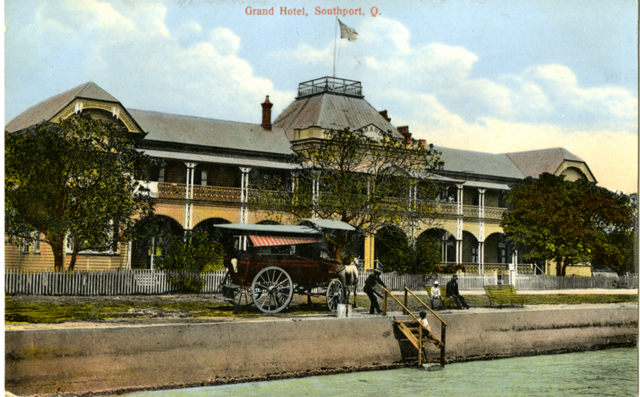 During this period of transition, Theodore Lenneberg proposed a new luxurious hotel at Deep Water Point and, with the help of a syndicate of Brisbane and local gentlemen under the banner of The Southport Land Company Limited. 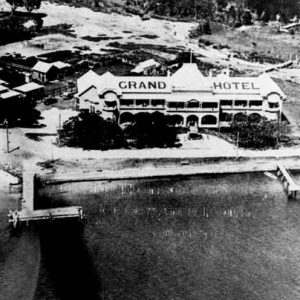 The landmark hotel, to be known as the Grand Hotel, was designed by architects John Hall and Sons and was built on the eastern side of the original Labrador Hotel. 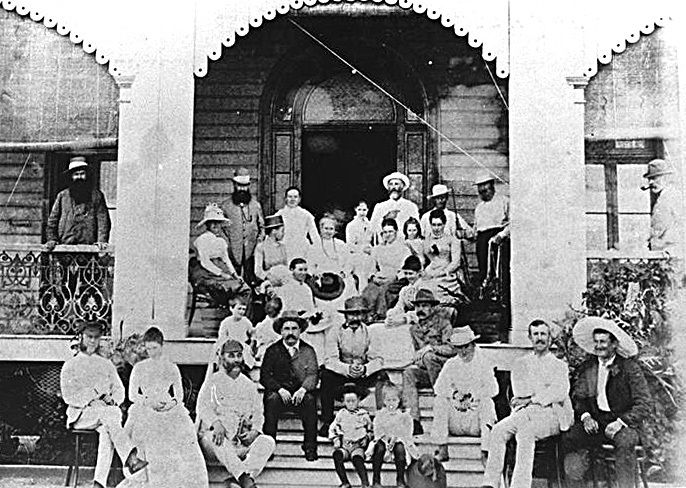 While the workers employed to construct the opulent American style hotel, which was similar to the design of the Queensland Parliament House, apparently referred to it as the ‘Mosquito Palace’ the syndicate had greater confidence in the location and potential of the area. Several shiploads of opulent furniture and fittings were imported from America to ensure that the new hotel lived up to its name and the hotel opened on 14 August 1886 with a gathering of 30 gentlemen from the company and friends. 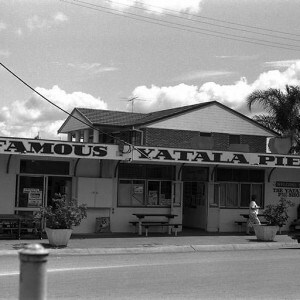 The building was described as “equal to any hotel in Australia” and guests enjoyed silver service in the dining room and every modern convenience. Steamers transported guests from Brisbane to Southport and horse drawn carriages would bring holiday makers from the train station following the opening of the railway line. 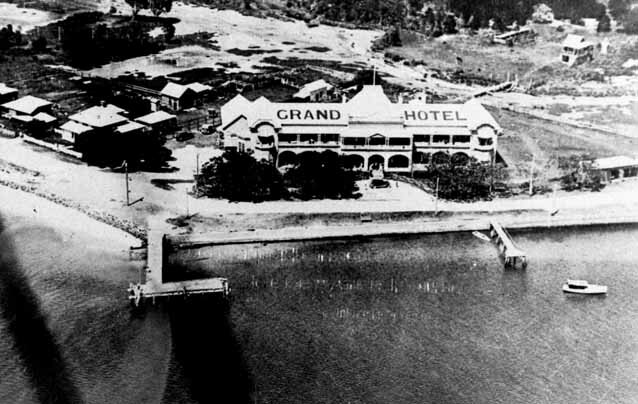 The Grand Hotel also boasted its own jetty whereby visitors could disembark, take pleasure trips to South Stradbroke and receive goods. The hotel had excellent stables at the back of the building for holiday makers arriving on horseback. 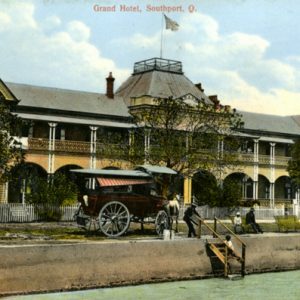 With excellent fishing and boating facilities, wealthy graziers and city socialites flocked to the hotel to enjoy a stylish holiday by the sea. The Second World War brought a downturn in patronage, but by 1950 the hotel once again emerged as a focal point for social life with the introduction of a ballroom and cabaret. 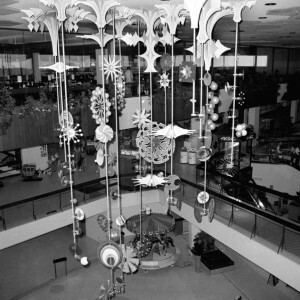 In 1959 the building was purchased by Stan Elson, an American, who made some modifications to the building and made elaborate changes to the entertainment provided by the hotel. He introduced nightly shows and cut price takeaway liquor. The shows, which featured Las Vegas style showgirls and dancers, were considered quite risqué for the time and crowds flocked to see them. The hotel flourished and Stan Elson’s association with the Grand Hotel continued for 15 years until he sold it in 1974. In July 1975, local residents watched as the iconic building burned to the ground. 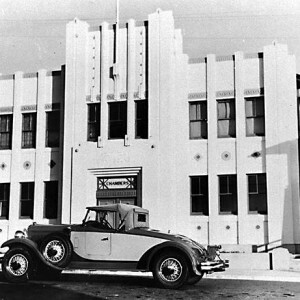 It was rebuilt in 1982, but the life of the second structure was short lived and it was demolished in 1990 and the site left vacant. The land was eventually acquired by Sunland in 1997 who planned to construct a new hotel with a resort and residential complex. The new Grand Hotel complex was opened on 10 December 2001.